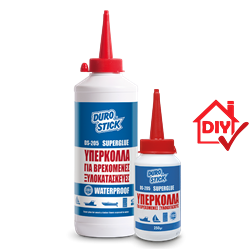 High quality, next generation water soluble glue, based on acrylic polymers. Odorless, it does not slip nor stain during application. Upon curing, it presents excellent durability, even when exposed to water for several days. It preserves its original flexibility, ensuring unbreakable bonding, against any stress due to vibrations or expansions and contractions. Ideal for bonding wood or timber constructs exposed to water or to heavy moisture loads. Ideal for demanding wood constructs of oak, beech, iroko, teak, cherry, walnut and other kinds of wood. Recommended for bonding wood skirting boards as well as MDF, cork and laminate. It is also suitable for bonding extruded or expanded polystyrene. Use it without priming on any kind of porous material, such as brick, plaster and concrete. Available in beige color. Classified D3/D4 per EN 204/205.